NASA astronaut Scott Kelly took this spectacular photo of Earth's auroras from space on Aug. 16, 2015. Kelly has also created stunning time-lapse videos from space during his one-year mission to the International Space Station. As Scott Kelly sails on through a yearlong mission in orbit, the veteran NASA astronaut has beamed down several videos from his perch on the International Space Station. 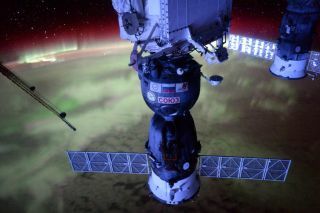 "Monday Motivation: May your electrons and protons be fully charged, so you are as bright as Aurora," Kelly wrote from the orbiting outpost on Monday (Aug. 17), along with a stunning time-lapse video of auroras shining behind the station's robotic Canadarm2. We combined some of Kelly's best time-lapse videos of Earth from space, and set them to music for you to savor. Most of the time-lapse videos focus on the view out the window: stars shining above Earth, night lights glowing below. But some of the videos have also shown life aboard the station. One short video, for example, was the first taste-test of the "Veggie" experiment, where astronauts are growing salad crops in space. The work has been ongoing for a few months, but astronauts only got to taste their wares earlier this month. Besides videos, Kelly has also been showing off pictures of Earth and space on social media. One of his regular features in this regard is a series #EarthArt, showing combinations of land and water and light below. Along with a recent picture, Kelly wrote, "The thing about abstract art: it appears not of this world. The thing about #EarthArt: it is our world." Kelly and Russian cosmonaut Mikhael Kornienko are spending about a year on the International Space Station to allow scientists to monitor their physical and psychological health. Only a small number of people have stayed in space for a year or longer, all aboard the Russian space station Mir in the 1990s. Kelly and his twin, Mark, are also participating in a study of twins to see how genetics may change after extended periods in space. Mark, a former astronaut, is participating in the study on the ground.